John Fogerty has written some of classic rock’s most enduring compositions, for Creedence Clearwater Revival and for his own solo career. Last September. 30th marked the 50th anniversary of the start of his writing one of his best ever known songs. “Today is a pretty important day in my life,” he says. “Fifty years ago, in the summer of ’67, I was released from active duty in the Army Reserve. I got home to the San Francisco bay area, right in the middle of the Summer of Love. I bought myself a little binder and on the first page I wrote the words ‘Song Title.’ And then I sat down and waited for something to happen. “After about a week, I finally had an inspiration and I wrote it down in my little music book. The inspiration was the words ‘Proud Mary.’ I didn’t write the song right away. A few months later, right when I had received my honorable discharge from the Army, I was so happy and excited, I ran in the house and started messing with my Rickenbacker and some chords came together and some words came together and I realized I was writing a song about a river boat. 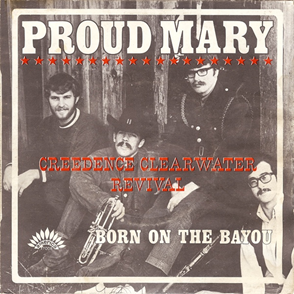 It wasn’t until January 1969 that “Proud Mary” was released as a single. It became the first of CCR’s five songs to reach #2 on the charts. (Though they scored nine Top 10 hits, but they never earned a #1.) In 2005, Fogerty was inducted into the Songwriters Hall of Fame.